I've been spending a lot of time with my family in New York recently, and one of the perks has been all the great food. 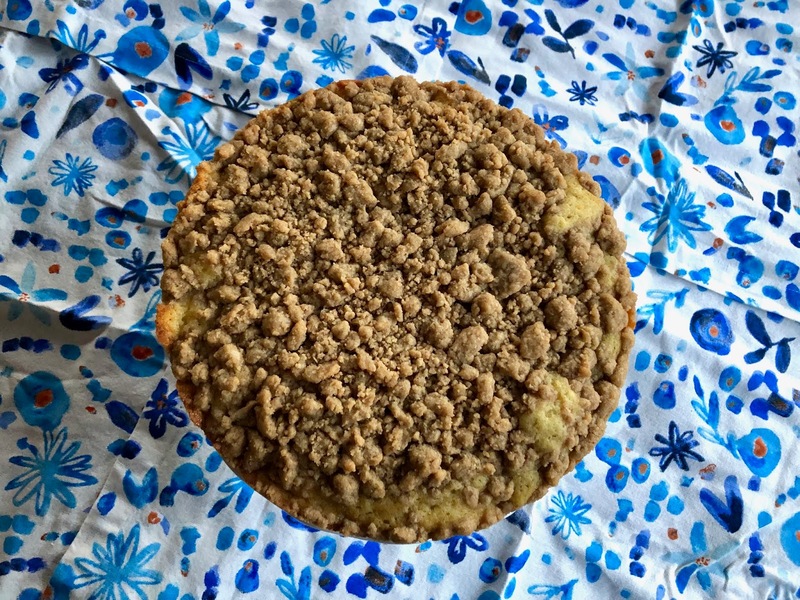 There's been bagels, deli meats, steak dinners, and plenty of dessert, but everybody always goes for the crumb cake. Unfortunately, before I could snag a piece, Jackson the family dog ate literally the entire pan. Yes, I was beat to a delicious breakfast by a golden retriever. 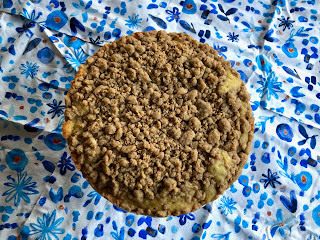 Fortunately, I have my own crumb cake recipe, and I can make it at home in Chicago where there's no large sneaky dogs (or hungry relatives) to compete with. I can attest that this is the best crumb cake recipe you'll ever make because--in addition to satisfying plenty of my family on Long Island--I had an entire exam in Food Functionality on the chemical processes that happen when you bake a crumb cake. I got an A, by the way. 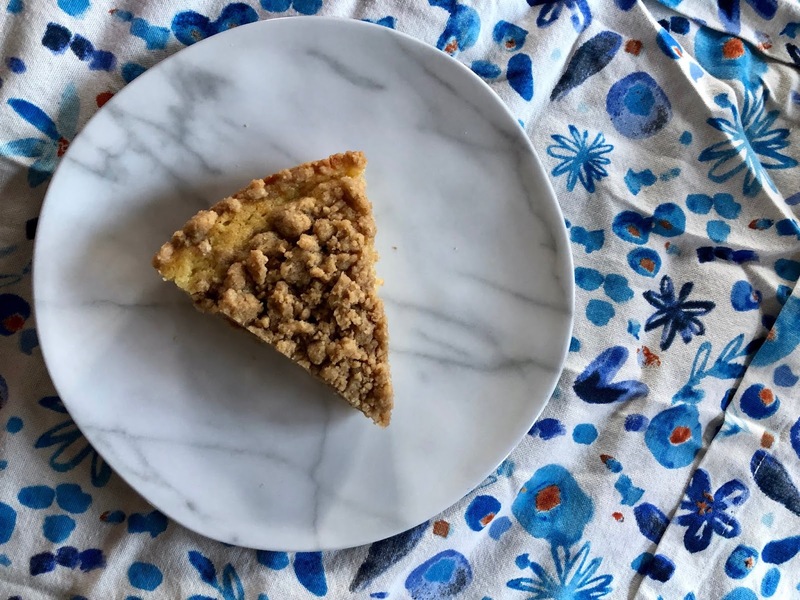 The trick to a great crumb cake is balancing the moist, delicate cake with a big pile of cinnamon-spiced crumbly topping. Real New Yorkers exclusively eat crumb cakes with a 50/50 ratio of crumb to cake, and this definitely comes close. I always start with the crumb so it's ready to go when I finish the batter; its an easy blend of sugar, brown sugar, cinnamon, salt, flour, and lots of melted butter. It should be just wet enough to break into crumbly bits. I usually add the flour last and stir it in gradually so I don't over-do it since it's easier to not add flour than it is to add more liquids. It can sit out while you make the cake batter, but I find that keeping it cold in the fridge makes it easier to crumble. Even though this can be considered a breakfast cake, you mix it up like any other cake recipe. The butter and sugar are creamed together, then you add an egg and an egg yolk plus a splash of vanilla. To avoid a lumpy batter, alternate the dry and wet ingredients. Here, those are cake flour (for an extra tender cake), baking soda, and salt plus buttermilk since buttermilk makes everything better. If you don't have buttermilk on hand, you can acidify milk with a splash of white vinegar or lemon juice, though I highly recommend just buying some buttermilk and using it in other cakes, muffins, pancakes, or even mashed potatoes. Once the batter and the crumble are ready, they go into a 9" cake pan and into the oven. 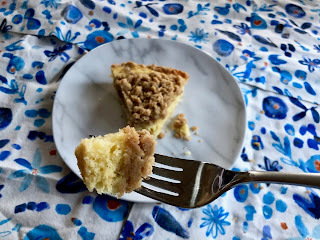 They're baked until a toothpick comes out clean, and you can even eat the slice warm since the beauty of crumb cake is you don't need to frost it so you don't have to wait until it's cool. To spice it up, you can add some fruit between the cake batter and the crumb, like some berries, peaches, or cherries. Those would help justify eating this for breakfast, or you can just pull a Jackson and have absolutely no shame. Whisk together 1/3 cup sugar, dark brown sugar, cinnamon, 1/8 tsp salt, and melted butter. Stir in 1 1/4 cups cake flour. Chill until cold. Heat oven to 325°F. Line an 8-9" square pan with parchment and grease. In the bowl of a stand mixer, beat the cubed butter and remaining sugar together until fluffy. Add the egg, egg yolk, and vanilla. Combine the cake flour, baking soda, and remaining salt together. Add the flour addition in 3 additions, alternating with the buttermilk in 2 additions. Spread the batter into the prepared pan and top with the streusel. Bake until golden and cooked through, 30-40 minutes. It's that time of year again: either you want to bake things to celebrate your significant other or you want to bake things to gorge on while you yell at the Bachelor to take out your anger for being single yet again. I'll be having a nice Galentine's Day dinner with friends and hanging with my cat, but that's no reason not to treat myself with some of my favorite recipes (and go crazy in the candy aisle on February 15). Although most people go with something elegant and/or chocolate-y (and I tend to follow suit), sometimes you just need an occasion to indulge in something red velvet. Red velvet cake is delicious but a bit too labor-intensive when you take into account all the frosting and decorating, and my red velvet crinkle cookies are a crowd favorite but a little messy. 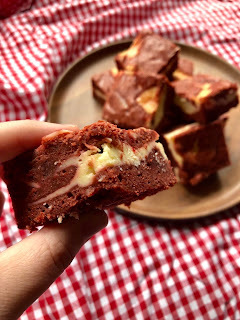 Enter these bars, which have all the flavor of red velvet and cream cheese frosting but in a portable bite and no decorating involved. Red velvet is kind of a weird flavor. It's technically chocolate but doesn't really taste like it, and it almost always involves buttermilk. You know how I add buttermilk to pretty much everything even if it doesn't really need it? Today I did the opposite: these are bars not cake, so they don't need the extra liquid. There is some cocoa powder because it's a brownie and it's red velvet, and the splash of white vinegar really does enhance the cocoa's natural redness even if it does smell bad. 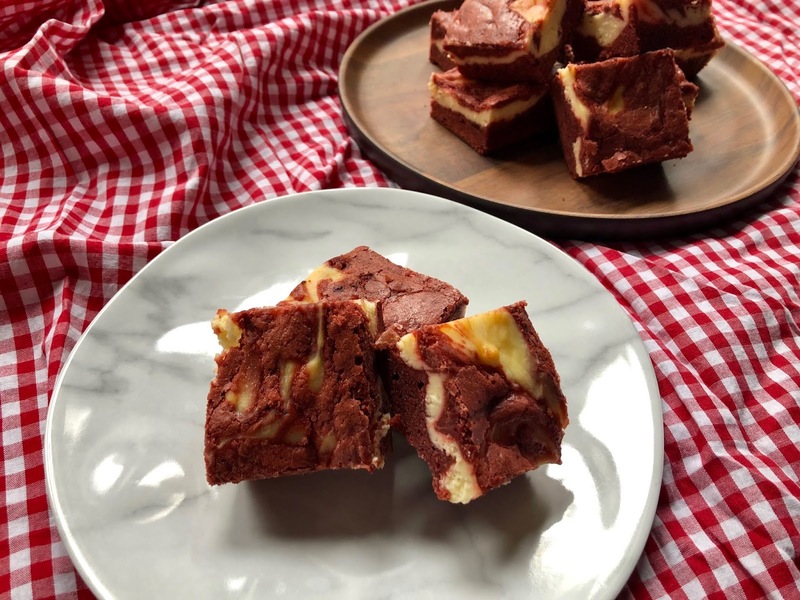 However, just cocoa and vinegar would make a really sad-looking brownie, let alone a red velvet brownie, so I add a ton of red gel food coloring. The bulk of the brownie is still a normal brownie. I mix a ton of melted butter and sugar together, then add vanilla, some cocoa, some vinegar to enhance the color, and all that food coloring. Eggs go in next, then just a bit of flour and salt to hold it all together. It doesn't need any leavening since you want that dense, fudgy texture. If you're unhappy with the color after you stir in the flour, you can stir in more dye; just be careful that you don't overmix the batter. 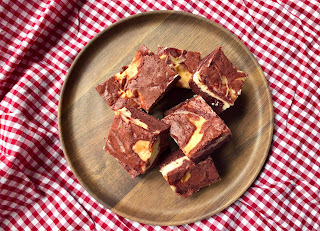 The cheesecake swirl is what really steps up these brownies. It's super easy: just beat some cream cheese and sugar together, add two egg yolks to help it set up during baking, and stir in some vanilla and salt for flavor. The key to that perfect marbled look is reserving some red velvet batter to dollop on top, since it's pretty hard to pull the batter up and over the cream cheese layer and still have it look pretty (and not just pink everywhere). A knife or offset spatula will give you more pronounced swirls, as opposed to just a toothpick. 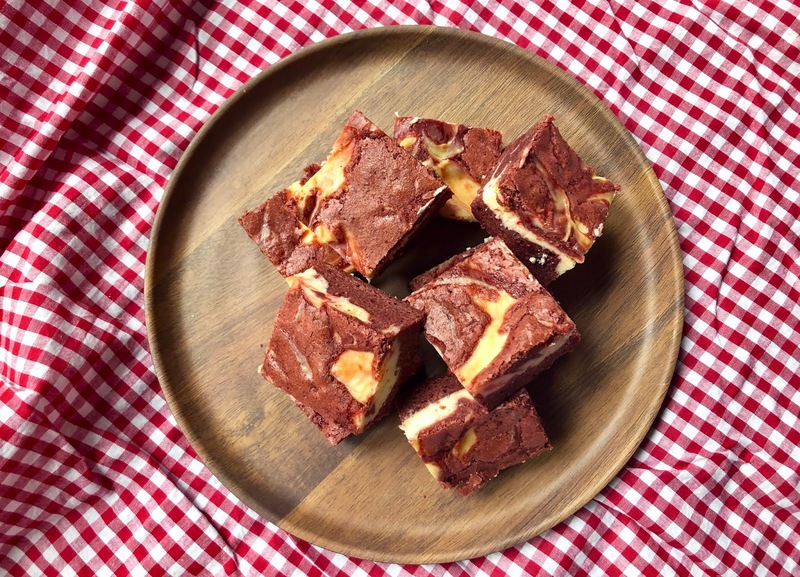 Once it's baked you're done, since any frosting or glaze would just cover up that gorgeous marbling. 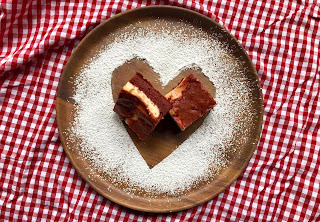 If you're feeling particularly romantic, you can skip the swirls and make some hearts instead. The great thing about red velvet is that it's perfect for any occasion, whether for Valentine's Day or just for your coworkers (as mine will experience when I bring these in for taste testing). Heat oven to 350F and line a 9x13" pan with parchment. Combine the flour and 1/2 tsp salt. Whisk the melted butter and 2 cups of sugar together. Add 1 T vanilla, then the cocoa powder, then the food coloring, then the vinegar. Whisk in the eggs one at a time. Fold in the flour mixture until just combined. Beat the cream cheese and remaining 1/2 cup sugar together with a hand mixer or stand mixer until smooth. Add the egg yolks, remaining 1 tsp vanilla, and a pinch of salt. Spread most of the brownie batter into the prepared pan. Dollop the cheesecake filling on top, then top with the remaining brownie batter. Swirl with a knife or toothpick and bake for 40-45 minutes or until cooked through.